The Simple Star Blocks Provide a Lot of Wiggle Room! 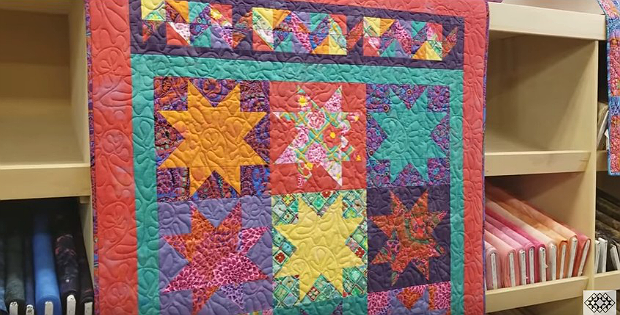 Brilliant Kaffe Fassett fabrics are simply wonderful in this striking quilt. The vibrant prints are offset by mottled solids that coordinate beautifully with the prints. Big stars showcase the prints nicely. They float in their backgrounds so you don’t need to worry about losing points. In fact, these are super easy stars to make, as any of the seams can be a bit off and no one will notice. The optional Kite Tail borders are made from half-square triangles trimmed from units included in the star blocks. This is a quick quilt to finish up. And, it will be lovely in other fabric styles and color themes. If vivid isn’t your thing, take advantage of the super easy star blocks by designing your own version in colors you enjoy. Donna from Jordan Fabrics demonstrates how the quilt is made in the following video. Click here to view the video at YouTube if it does not play on your device. You’ll find a nice selection of Kaffe Fassett prints here. The Grunge fabrics can be found here. The finished quilt is 41″ x 71″. 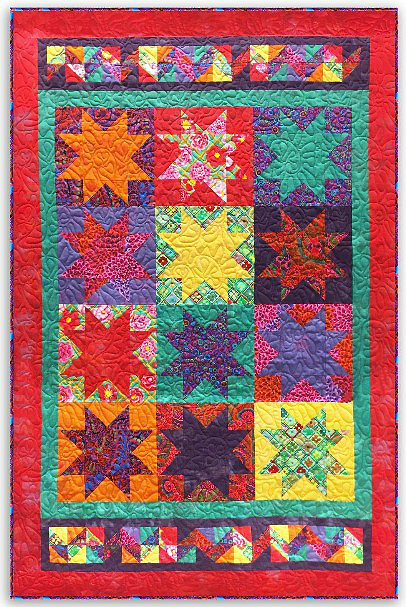 Click here for the free “Kaffe Stars” quilt pattern.